If your child is overweight, chances are you want to help him get healthy. But sometimes that means ignoring popular diet advice. Often, what works for adults may not be best for kids. “Children have their own set of nutritional needs for healthy growth and development,” says Tamara Melton, a dietitian and instructor at Georgia State University. The best way to help a child lose weight? Work with his pediatrician to make sure that he slims down in a safe way. But you can also think about these simple steps to help your child — and the whole family — live a healthier, fitter lifestyle. 1. Find the right weight goal. Many younger children shouldn’t actually shed pounds. “Since they’re still growing, they may need to maintain their weight or gain at a slower rate,” Melton says. Older teenagers may be able to lose a half a pound to 2 pounds a week. Your child’s doctor can let you know what you should aim for. 2.Say “no” to diets and supplements. Your first impulse may be to put your child on a diet. But unless her pediatrician recommends it, avoid these kinds of major calorie-cutting plans. They may mean she won’t get the nutrients and calories she needs to grow. Plus, many diets may teach your child that certain items are “bad” or off-limits, which can change how she sees food later in life. Weight loss drugs or supplements aren’t a good idea either (except when the doctor prescribes them). There’s little or no research on how these pills affect children, so they may not be safe. 3. Get the rest of the family on board. Instead of singling out your child, have a conversation with the whole family about how you’d like to make healthy changes for everyone, including yourself. “Kids learn their habits from their parents,” Melton says. So it’s important to lead by example. One study found that children were much more likely to lose weight when their parents also slimmed down. 4. Start small. Don’t try to overhaul your family’s diet all at once. Instead, try making a few changes at a time. Small, manageable tweaks are more likely to last for a lifetime, Melton says. Try not to eat at restaurants or fast food joints more than once a week. Buy more fruits, vegetables, and other healthy snacks and fewer chips, cookies, and candy. If these high-calorie foods aren’t around, your kids can’t eat them. And while you shouldn’t declare any treats “off-limits,” help your kids learn to have them in moderation. Keep an eye on portion sizes. Large plates and glasses encourage eating more, so you may want to downsize your tableware. 5. Eat meals together. When you sit down as a family (and not in front of the television), you’ll encourage healthier habits. One study showed that children who shared three or more family meals a week were 20% less likely to eat unhealthy foods and 12% less likely to be overweight. At the start of each week, schedule a few family breakfasts, lunches, or dinners. If you can, get everyone involved in planning and cooking the meals. Have your child pick out their favorite produce in the grocery store. Blend together a fresh fruit smoothie for breakfast or a snack. Serve a fruit or veggie at each meal or snack: Top cereal with berries, pair a sandwich with a side salad, and serve veggies with hummus between meals. Use veggies instead of meat in child-friendly dishes, such as chili, lasagna, and spaghetti. Make exercise a family outing. Go on walks, hikes, or bike rides together. Help your child find an activity she enjoys, whether that’s soccer, swimming, dancing, or simply running around the playground. Encourage her to spend time outside instead of in front of the TV or computer. NEW YEAR … a new & more AWESOME you!! In 2017 do you want to lose weight, look better, have more energy, be healthier and improve your memory? Have a drink of water. You don’t necessarily have to follow the “eight glasses a day” rule, but you do want to drink enough water to keep your body well hydrated. You can tell you’re well hydrated when you don’t feel thirsty and your urine is light-colored. You are drinking enough once your “pee is clear.” Start the day with a glass of water and then get to the fridge or water cooler for a refill every couple hours. Drinking water keeps your skin moist, supple, and elastic—thus lessening your risk of developing dry issues like dermatitis, aging skin, and infection. 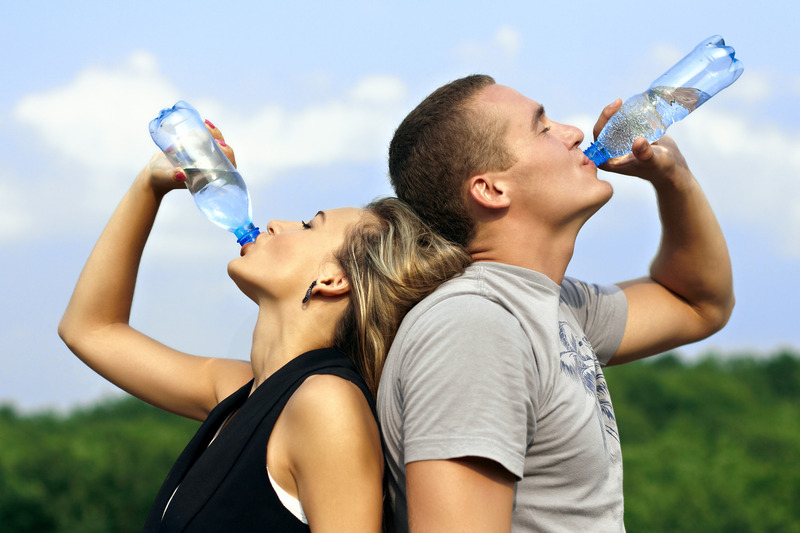 Being hydrated is essential for keeping those muscles strong, lubricated, and energized. Why? Because H20 aids the transport oxygen to your muscles so they are prepared when exerted. When you overheat; you sweat. And the evaporation of sweat on your skin is the way the body cools itself down and maintains a healthy temperature. Understandably, drinking enough fluids is essential for sweating and replenishing your water supply. Proper hydration will improve the blood flow and oxygen flow to your brain, strengthening cognitive function and memory. Your joints, spinal cord, eyes, and brain are surrounded and protected by water. Remaining hydrated is vital to their well being. Water aids the elimination of waste material, making bowel movements and urination possible and comfortable, and excreting waste products that would otherwise poisoned the body and cause disease. Water provides the ability for your body to eat and digest food—via the water is in your saliva and within your digestive tract. Think of drinking water as your secret weapon to fighting off illnesses, improving lymph fluid within the immune system and preventing headaches, joint pain, muscle weakness, fatigue, and lightheadedness. Training in the Martial Arts is a life style. Health, happiness, safety, balance and strength are some of the many benefits. Maintaining a well conditioned body starts with good hydration. Want to boost your health & fitness even further beyond hydration? And want to help your friends feel more awesome this new year??…. Why not invite them to find out more about the Endeavour Fighting Fit Fitness Challenge.. CLICK HERE for more info!